Wu Ming-yi. The Man with the Compound Eyes. Tr. Darryl Sterk. London: Harvill Secker, 2013. US edition: New York: Pantheon Books, 2014. 304 pp. 978-0-307-90796-7. The Trash Vortex in The Man with Compound Eyes (published in Taiwan as 複眼人/Fuyan ren in 2011, and now available in a strong translation by Darryl Sterk) is a massive floating island, stable enough in spots to bear the weight of a helicopter. This is Wu Ming-yi’s version of the actual Great Pacific Garbage Patch, a skim of pelagic plastics and other detritus floating at and near the surface of the central north Pacific. The actual garbage patch is not solid, nor has it breached the swirling currents of the North Pacific gyre. Profoundly isolated, it is an object for the imagination—a massively extended concentration of tiny particles invisible to satellites that nonetheless conjures images of floating islands and trash-clogged waves. Together, these vortices embody the conceptual and perceptual challenges that shape our mostly failed attempts to understand and react to anthropogenic climate change: though convinced that we have trashed “nature” on a previously unimaginable scale, our fantasy visions of ecotastrophe are more often than not contradicted by an ambiguous array of statistics, projections, and microscopic particles. For some time now, it has been easier (and far more entertaining) to consume ecological collapse narratives along the lines of Roland Emmerich’s 2004 disaster film, The Day After Tomorrow, than to embrace the prognostications of the Kyoto Protocol. While the former gleefully depicts an instantaneous transformation of the climate, the latter asks its readers to envision climate change on a geological timescale extending far beyond the lifespan of any one individual. To phrase it differently, these modes of representation force you to chose between two mindsets, the homicidal-heroic and the suicidal: to think climate change as a cinematic catastrophe, on the one hand, is to imagine the overall decimation of human populations and the rise of a band of heroic survivors onto whom one can easily cathect; to think climate change on a geological scale, on the other hand, requires killing oneself and one’s immediate descendants in the mind’s eye. The artificial gulf between these options has, however, begun to narrow. As consensus grows that climate change is real—that the wave is already upon us—it has become more common to accept that we are living, loving, and dying much as we always have, but in the midst of a changing climate. And so it is through this new understanding that the bombast of the disaster narrative and the specialized vocabulary of the scientific report have come to be joined by a third form, what Zadie Smith calls “intimate words,” language that conveys a sense of personal loss in the face of global change. In The Man with the Compound Eyes, Wu Ming-yi marries the gigantism of ecological collapse narratives with an informed awareness of environmental change as an intimate, local phenomenon. Despite the occasional imprecision (for examples, see notes 11, 12, and 15), Darryl Sterk’s translation aptly renders both the intimacy and the lyricism of Wu’s original. Set partly on Taiwan, partly on the fictional Pacific island of Wayo Wayo and partly on the trash island, the narrative thrums with the push and pull of oceanic rhythms that reach an early climax when the three islands and the yearning, damaged characters that inhabit them collide. On tiny Wayo Wayo, the teenage Atile’i and his lover Rasula are forced apart by a coming of age tradition that casts second sons adrift. After a journey on the open sea, Atile’i is washed half-alive onto the vortex, where he uses trash to build an improvised shelter and make tools for hunting, thus domesticating and rendering quotidian the cinematic sublimity of the vortex. Before long, both he and his “island” collide with the eastern coast of Taiwan. A pregnant Rasula soon follows, though the currents take her mostly beyond the purview of the novel. The separation of Rasula and Atile’i is mirrored by the tragedy that defines Alice Shih’s life—her husband, Thom, and son, Toto, have at some point in the recent past disappeared during a mountain climbing trip. Up to this moment of delusion and despair, Alice has lived in what Wu’s original calls H-縣, or H County, a lightly fictionalized stand-in for Hualian County and City on the eastern coast of Taiwan. “H-縣” harks back to a familiar convention of early twentieth century Chinese and Japanese (and earlier European) fiction, in which abbreviated city names often allude to recognizable places. Sterk, perhaps opting for editorial irony, simply renders the name Haven. Not only has this “haven” lost any charm it once held for Alice, but the home she built with her husband is now on the brink of being swallowed by a steadily rising sea. As she drives down the coastal highway on her last night, she registers the extent of this encroachment with a shock that shows her mind has been elsewhere: “when had the sea gotten that close?” (22). By the end of the chapter, the morning after an earthquake “strong enough to reawaken people’s childhood memories,” she wakes to find “herself standing on a remote island in the midst of an immense ocean, as frothy waves rolled relentlessly across the distance towards the shore” (26). The sea has ceased its stealthy creep and begun its annexation. Among the flotsam and jetsam that now surround her house, Alice finds a small, bedraggled kitten, which she adopts and names “Ohiyo,” (a misspelling of) the Japanese word for “good morning.” With the arrival of the new day Alice’s grief begins to loosen its grip. That the return of her will to live coincides with the partial destruction of her house suggests something of the symbolic weight of homes and homelessness in The Man with the Compound Eyes. Wu’s most compelling characters do not simply occupy buildings, they plan and construct them with their own hands. This is especially true of Atile’i, who replicates the vernacular architecture of Wayo Wayo on Trash Vortex, and the Taiwanese Alice and her Danish partner Thom, who build a carefully sited, ecologically sensitive imitation of a real structure, Erik Gunnar Asplund’s Summer House at Stennas, Sweden. Their home stands in stark contrast to the surrounding built environment: “Alice often felt that except for some houses belonging to the aboriginal people or buildings from the Japanese era, now maintained as tourist attractions, the artificial environment had been intended to spite the natural landscape” (18). And when Thom reports his impressions of architecture found up and down the coast he proclaims, “with total self-confidence [that] many people who build houses don’t understand that people actually “live” in their houses. . . . I want to build a home we can live in for a long, long time” (52). One of the many tragedies of this engrossingly tragic novel is that this house, as well as those built by some of the novel’s other central figures, is demolished by the giant waves that carry ashore the trash vortex. Already emotionally bereft and now physically homeless, Alice spends the bulk of the novel seeking a form of dwelling less vulnerable to the volatility of an ecologically compromised world—dwelling with and in other people. Although the waves that bring the trash vortex finally render her house totally unlivable, they also bring with them her real salvation, a person with and through whom she can learn to live once more. When Atile’i is washed ashore, injured and scared, it is Alice who saves him and nurses him back to life, adopting him as part surrogate husband and part surrogate son. Together they retreat to a friend’s hunting lodge in the mountains and prepare to retrace Thom and Toto’s steps into the rugged forests of the Taiwanese interior, a landscape inhabited by the enigmatic “man with the compound eyes,” whose insect-like eyes simultaneously perceive and project the world as the sum total of the vision of all phenomena. This is a homecoming for Atile’i, a kind of noble savage whose powers of perception and mimicry echo those of the man with the compound eyes. Hypersensitive to the flora and fauna around him, Atile’i can imitate birdcalls so well that “he fools even the birds themselves” (174). He is more than a simple mimic, however. Like all Wayo Wayoans, Atile’i is coterminous with the natural: “They did not ask how old people were, but simply grew tall like trees and stuck out their organs of increase like flowers. Like the obstinate clam they just passed the time. Like a sea turtle each islander died with the curl of a smile at the corner of his mouth” (13). Wu’s portrait of the people and traditions of the fictional Wayo Wayo is lovingly detailed, but it also bears the mark of a primitive romanticism so retrograde as to seem almost ironic. Do the islanders represent an ecological alternative to the death-drive of global capitalism as embodied by the ethnically Han Taiwanese, or are they a knowing allusion to a Western literary tradition fraught with racist and imperialist origins? The former casts the novel’s final pages in an especially bleak light, while the latter is complicated by the ways in which the Wayo Wayoans are mirrored by Wu’s more well-rounded native Taiwanese characters, especially Alice’s friend Dahu, a Bunun aboriginal with a “Master’s degree in forestry ecology,” and a special sense for the magic of the mountains, and Hafay, a Pangcah with a set of extra “little big toes[s]” (98). Hafay’s extra toes bring immediately to mind a character with a set of extra little fingers in the Mainland Chinese novelist Ah Cheng’s classic The King of Trees, a Daoism-inflected critique of environmental destruction wrought during the Cultural Revolution. In that work, the extra fingers are part of a larger category of seemingly “useless” or superfluous natural phenomena (including a primeval forest, the destruction of which forms the core of the story) that are both supremely vital and useful. We never learn whether Hafay’s toes serve a special purpose. Just as the Wayo Wayoans grow “like trees” and mature “like flowers,” her body is a symbol of the irrepressibly organic, each of her extra toes “like an adorable millet sprout” (295). Within the overall structure of the novel however, the figure of the native serves a distinct critical purpose. Throughout The Man with the Compound Eyes, Atile’i, Dahu and Hafay’s earthiness and perceptual powers contrast sharply with the obliviousness of the ethnically Chinese inhabitants of the island. For example, in the quote that opened this review, the “coastal aboriginal villagers” function as both careful observers of the hailstorm and repositories of local natural history (though they too seem to miss the wave). By contrast, the failure of the media and spectators to witness the trash vortex collide with the coast is merely one symptom of a chronic failure of perception. Though they hear the cosmic voice with which the wave speaks, they can neither discern its source, even as it roars their way, nor understand its message. The sea was battering the base of the soaring bluffs with various kinds of debris. Hordes of tourists were issuing continual exclamations of amazement as they admired the magnificent view from inside their cars. Sara was more than a little shaken by the scene. The cliff itself was glorious, but she couldn’t get over how these tourists turned a blind eye to the sorry state the coast was in, regarding it as mere spectacle. She turned on her paper-thin tablet and looked up this stretch of coastline on Wikipedia. Though glorious, the cliffs only register as a spectacle, a site ready made for the programmatic, car-bound consumption of a nationally iconic landscape. The blindness of the tourists stems not from any literal, physical inability, or even from an aversion to trash, but rather from a faulty conception of landscape in general, and the famous landscapes of the east coast of Taiwan in particular. It is no wonder they cannot see the inhabited coast for the iconic landscape. During Alice’s tenure there, Haven has become popular with rich second homeowners, who have covered its hills and coasts with a post-modern assemblage of “exotic edifices, not one of them authentic, pretty much as if a global village theme park had been built there as a joke. There were fallow fields and empty houses everywhere, and the fat cats who owned these eyesores usually only appeared on holidays” (18). This is no longer a landscape to be cultivated or inhabited, as Alice and Thom tried but ultimately failed to do, but rather a space of empty homes and emptier signifiers, a space whose fame masks its steady disappearance. The familiarity of these events, especially to Taiwanese readers, lends the The Man with the Compound Eyes a strongly realist and critical tone. In this sense, the novel is an exploration (and often an indictment) of the Taiwanese relationship with the island’s sparsely populated east coast, a landscape laden with symbolism but beset by a legacy of greed, negligence, and willful blindness. The subtlety of the novel’s future setting in a world “somewhat similar but not quite the same” as our own, helps casts this familiar Taiwanese present in the sharper light of retrospection. It also allows Wu to imagine the rapid unfolding of a series of environmental catastrophes that have remained mostly in the realm of projection, catastrophes that render our world “rich and strange” and come with all the forceful symbolism of the heartbreak at the novel’s core. Not surprisingly, the futurity of The Man with the Compound Eyes has already inspired comparisons with a variety of familiar genres—from speculative fiction to sci-fi and cli-fi (climate fiction)—just as its more fantastic elements have attracted the label of magical realism. One might easily find aspects of all of these in The Man with the Compound Eyes (though I think Wu owes a more direct debt to someone like David Mitchell and the postmodern bricolage of Cloud Atlas). Far more important than such categories and possible genealogies of influence, however, is how the novel unfurls its fable of environmental catastrophe through the intimate voices and movements of its characters. It asks us to imagine not just the destruction of a familiar world and way of life, but how individuals and communities might learn to continue inhabiting a planet that is changing, and for those among us who inhabit the world’s endangered coasts and islands, disappearing beneath our feet. Warm thanks to Tristram Wolff and Lawrence Zi-qiao Yang for their generosity and time in reading and improving this review, and also to Kirk Denton, editor of MCLC, for publishing it. I would also like to extend a special thanks to Michael Berry, book review editor for literary translations, for his continued support and kindness. 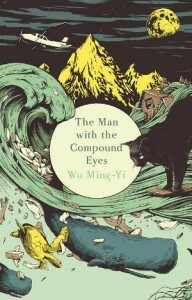 Page numbers refer to the following edition: Wu Ming-Yi, The Man with the Compound Eyes. Tr. Darryl Sterk (London: Harvill Secker, 2013). Wu’s trash island joins a long and storied line of floating literary and mythical islands, from the Odyssey’s Aeolia and the Chinese Penglai (the abode of immortals which so obsessed the first emperor of the Qin Dynasty), to islands in early colonial accounts of the Americas and Shakespeare’s The Tempest, not to mention more recent floating islands in Verne (“L’Île à hélice”) and Saramago (The Stone Raft), among many others. For more on the phenomenon of floating islands (and literary islands more generally), see Stephanos Stephanides and Susan Bassnet, “Islands, Literature, and Cultural Translatability,” Transtext(e)s Transcultures (Special Issue, “Poésie et insularité,” 2008, available online at http://transtexts.revues.org/212) and Marc Shell, Islandology: Geography, Rhetoric, Politics (Stanford, 2014). Timothy Morton has repeatedly explored the conceptual obstacles to accepting the reality of, and the need to respond to, climate change. In Ecology without Nature: Rethinking Environmental Aesthetics (Harvard, 2007), he argues that nature writing’s aesthetic and philosophical grounding in Romanticism and primitivism (especially as filtered through Heidegger) presents a direct obstacle to the kind of real political, economic and social change necessary to respond to global warming. In the more recent Hyperobjects: Philosophy and Ecology after the End of the World (Minnesota, 2013), Morton details how the massively extended scale (both spatially and temporally) of climate change transforms our everyday experience of space and time. In a world where weather has become coterminous with climate, every storm is an omen and manifestation of global warming. In other words, there is no outside or beyond climate change. “The thinking style (and thus writing style) that this turn of events necessitates is one in which the normal certainties are inverted, or even dissolved. No longer are my intimate impressions “personal” in the sense that they are “merely mine” or “subjective only”: they are the footprints of hyperobjects, distorted as they always must be by the entity in which they make their mark‑that is, me. I become (and so do you) a litmus test of the time of hyperobjects. I am scooped out from the inside. My situatedness and the rhetoric of situatedness in this case is not a place of defensive self-certainty but precisely its opposite” (5). Though indebted to the Romanticism that Morton attacks in Ecology without Nature, The Man with the Compound strikingly embodies the new thinking and writing styles made necessary by the inescapability of the hyperobject. It goes without saying that the millenarianism of many ecological collapse fantasies, with its faith in a retributory nature that has been pushed ‘too far,’ is in no way conducive to changing the laws, behaviors and economic system that have so altered the planet. It often seems easier to imagine the end of all human civilization than a transformation of the system of global capitalism that has brought about our current ecological crisis. Zadie Smith, “Elegy for a Country’s Seasons,” New York Review of Books (April 3, 2014). It is through these intimate words that Wu Ming-yi’s novel inadvertently answers a question posed by Patricia Yaeger in “Sea Trash, Dark Pools, and the Tragedy of the Commons,” an essay that frames a collection of articles on the theories and methodologies of “oceanic study” in the journal PMLA (125.3): “How do we think about the tragedy of the commons in all its metaphoric and symbolic intensity without transforming literature into ecology.” PMLA 125.3 (May 2010), 526. Wu Ming-yi’s background suits him perfectly to this task. A professor of literature and creative writing with a PhD in Chinese literature, Wu is also an accomplished artist, scholar of nature writing, lepidopterist and environmental activist. Over the course of the first half of the novel, individual sections juxtapose and alternate chapters that focus on the novel’s main characters—Atile’i, Alice, Dahu and Hafay—gradually bringing them together into one section (the seventh and eighth, which contain chapters 13-20) only after the vortex arrives. After Chapter 20, the focus of the action shifts among the European visitors Detlef and Sarah, as they travel down the coast, Atile’i and Alice as they travel into the mountainous interior and the man with the compound eyes, who gives his name to four separate chapters, one in each of the four remaining sections. The original language of the sentence beginning “Anytime he went out” is more ambiguous than Sterk’s translation indicates. It reads “她還得擔心出門會不會遇上該死的酒醉駕駛…” (32). for which I suggest the following slightly modified translation: “She also had to worry every time [she] went out that some damn drunk driver…” The original provides only one personal pronoun, the gendered 她 ta (she), which beings the sentence. In that position, 她 ta is clearly the subject of danxin 擔心 (worry). The ambiguity comes with what follows: does “she” worry that her son might be killed when he goes out or when she does? We must not forget that at this point in the novel Toto exists only spectrally, as an embodiment of Alice’s grief. The need to keep him alive is all that keeps Alice alive, and so it would make sense that her fear of dying is really a fear that he might die with her. All page numbers from the original novel come from: Fuyan ren 複眼人 (Taipei: Xiari, 2011). Sterk’s “natural landscape” is actually Wu’s fengjing 風景 (landscape, scene, view), a word with a long aesthetic legacy in which “natural” and the “artificial” environments are not necessarily dichotomized. Similarly, earlier in the same chapter Sterk uses “nature” to translate a phrase, 山和海, that is both more spatially specific and less culturally and philosophically weighted than English word “nature.” The original reads: “現在山和海被馬路推到很遠的地方” (28), which Sterk renders as, “Now the highway had pushed nature far away” (17). It is not, of course, that nature has been pushed away, but rather that the sea and the mountains, whose point of contact constitutes the coast, have been separated and pushed far apart by the road. In the process, a formerly distinct zone of contact and separation (comprised of the integral components of Chinese landscape aesthetics, mountains and water) has been blurred, a transformation that foreshadows the rising level of the sea and the approach of the massive wave that swamps the coast. If Alice feels that “all the things she had at first found so endearing [about Haven]…were gradually withering, growing unreal, losing their hold on her” (17), it is at least partly because the very ground she occupies has undergone one physical transformation (it has been bifurcated by the new coastal highway) and is on the brink of a far greater change (total inundation). Though often inspired, Sterk’s translation occasionally glosses over such important subtleties. Or, as one reader of a draft of this essay has suggested, are these characters and their ‘nature’ part of Wu’s attempt to create an “island poetics” that subverts not only the hegemony of the sinocentric but also, potentially, the anthropocentric? I thank Lawrence Zi-qiao Yang for this intriguing reading (which I hope I have rendered accurately here) and for his generosity in reading this review. The trash vortex has also attracted attention in academic writing, including Patricia Yaeger’s excellent 2010 article, “Sea Trash, Dark Pools, and the Tragedy of the Commons” (see note 2).